NOTE: -Take care not to scratch the front bumper, - Put on gloves to protect your hands. - When prying with a flat-tip screwdriver, wrap it with protective tape to prevent damage. 1. Remove the clips securing the front air spoiler (A) from under the front bumper (B). NOTE: To release the clips, pry up on the center pin at the notch (C). 2. Pull out the front air spoiler to detach the hooks (D), and remove the spoiler. 3. 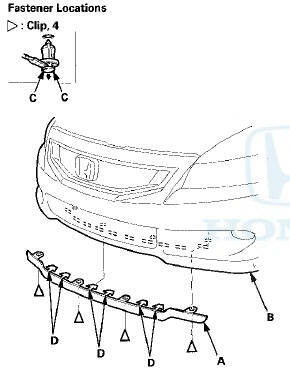 Install the spoiler in the reverse order of removal, and note these items: - If the clips are damaged or stress-whitened, replace them with new ones. - Push the hooks and the clips into place securely.